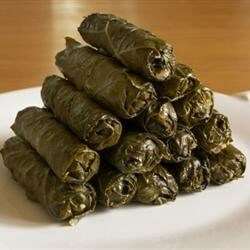 "These are grape leaves, stuffed with a tantalizing mixture of rice, fresh dill, mint and lemon. 'Yum' is the only one word to describe these. These can either be a main dish or an appetizer, depending on your appetite. Serve with good crusty bread and a Greek salad, if desired." In a large saucepan over medium-high heat, saute the rice, onion, dill, and mint for about 5 minutes, or until onion is soft. Pour in 1 quart of broth, reduce heat to low and simmer for another 10 to 15 minutes, or until rice is almost cooked. Stir in 1/2 of lemon juice and remove from heat. Pour chicken broth over all to cover grape leaves. Cover pot and simmer for about 1 hour (do not boil, because this will make the stuffing burst out of the leaves). Remove from heat, remove cover and let cool for 1/2 hour. Transfer to serving dish and serve. These roasted green bell peppers are stuffed with a savory feta and rice mixture. If using fresh grape leaves, plunge into a deep container of very hot water for about 10 seconds, to soften (don't let the leaves lose their fresh green color). Fabulous recipe! A couple of changes: veggie broth instead of chicken, dried herbs (adjusyed quantities), a little parsley, and grape leaves from a jar. It came out awesome. This is an excellent recipe. For starters, the rice is awesome on its own! When I made the stuffed grape leaves I added a handful of toasted pine nuts, and that gave it a bit of extra lift.